If you’ve lost teeth due to accident, injury, or gum disease, we can create a permanent bridge to restore your solid smile. A bridge not only fills the gap, but it also prevents repositioning of remaining teeth. It can also correct a misaligned bite, improve chewing function and speech articulation, and provide internal structure for the face to give you a more youthful appearance. First of all, a bridge is a prosthetic tooth (or teeth) that attaches on one or both sides to teeth prepared with dental crowns. A fixed bridge is permanently joined onto the neighboring abutment teeth (crowned teeth) and consists of three basic units: the false tooth or teeth (called a pontic) and two abutment crowns. The style of bridge we suggest will depend upon the strength and health the abutment teeth, as well as the location of the gap in relation to the rest of your dentition. 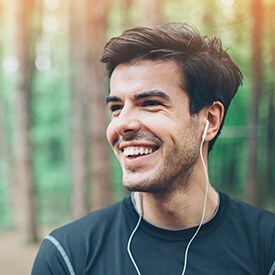 If healthy adjacent abutment teeth aren't available, a surgically-implanted metal post, known as a dental implant, may offer a solid alternative. For a bridge that replaces many teeth, we may recommend a removable partial denture or implant-supported prosthesis. With proper care, a fixed bridge may last at least 8 to10 years. If you have questions about crown and bridgework or any other dental prosthetic, call our Fort Worth dental office. We will be happy to discuss the options and schedule your evaluation. A broken or severely worn tooth requires special care to regain appearance and function. At our Fort Worth dental office, Dr. Cheng, Dr. Thorburn and Dr. Tijerina expertly restore structural integrity to compromised teeth with crowns, inlays, and onlays. 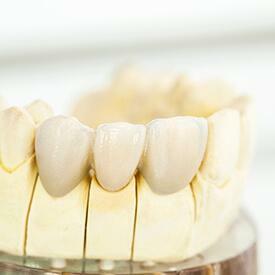 Our dentists use all-ceramic, porcelain-fused-to-metal, and gold crowns for custom restorations. We’ll consider the location of your tooth and the amount of stress it receives to determine which material to use. Crowns, also called caps, fit snugly atop damaged teeth. A custom-made crown will match your existing tooth color, so it will blend seamlessly into your smile. Custom crowns take two visits to design and place. At your consultation, we’ll examine your mouth, take a dental impression, and fit you with a temporary. A skilled ceramist at a trusted lab will hand make your custom restoration from highly esthetic dental porcelain that reflects light like natural tooth enamel. When your crown is completed, we’ll remove your temporary and permanently affix the new crown to renew your smile and return oral comfort, function, and strength. If a damaged tooth doesn’t need a full crown but requires more restoration than a filling can provide, our dentists may recommend an inlay or onlay. Like crowns, inlays and onlays are custom-made restorations that provide integrity to compromised teeth. Inlays fit within the cusps, or bumps, of a tooth. Onlays fit over one or more bumps. For our patients who don’t require a custom restoration, we can mill a durable, natural-looking crown, inlay, or onlay in about an hour with our revolutionary CEREC machine. Click here to learn more. Let us restore your treasured smile. Call our Fort Worth office today to schedule your appointment with Dr. Cheng, Dr. Thorburn and Dr. Tijerina. Our patients in Weatherford, Benbrook, Burleson, and surrounding areas are experiencing renewed dental vitality with their custom restorations.